After several months of patient waiting, I finally received my Pebble in the mail a few weeks ago. This Pebble is not the kind that gets stuck in your shoe (hopefully); it's a brand-spankin'-new, Kickstarter-funded "smart watch"—an e-paper bracelet that connects to your iOS and Android devices, which means you can tell the time and do some other cool stuff too. The "other cool stuff" is the part that had Kickstarter backers excited in early 2012; excited to the tune of $10.2 million. 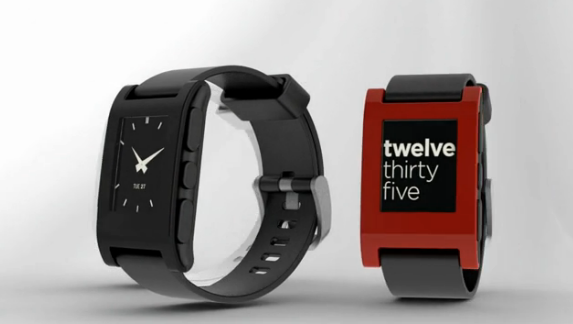 During the fundraiser (which ended in May of last year), backers who pledged $99 or more were promised one Pebble watch, which now retails at $150. While it's not perfect, it is a rather interesting step forward that should culminate in a healthy platform later this year. At its most basic level, Pebble tells the time. You may scoff at that—it's a watch you say, of course it tells the time. But it does its time-telling really freakin' well. It currently ships with three default watch faces, as well as 12 others that you can load onto the watch with the companion app (free on iOS and Android). By far my favorite custom watch face is "Fuzzy Time," which rounds the current time to the nearest 5-minute interval and translates that number to what you might say if your friend asked you the time. While seemingly trivial, I love this rough approximation of time. Rarely do I need to know that it's 5:13:23pm, but seeing that it's "quarter after five" is awesome.